For most of my art life, I have been interested in two things general areas, mandalas and subsequently sacred geometry. Mandalas are circles which present a way to meditate upon ideas or open doorways of perception to other states of awareness. Sacred Geometry is a study of how circles, lines and shapes interact with the natural world, or the way we construct the world using geometry for sacred purposes. 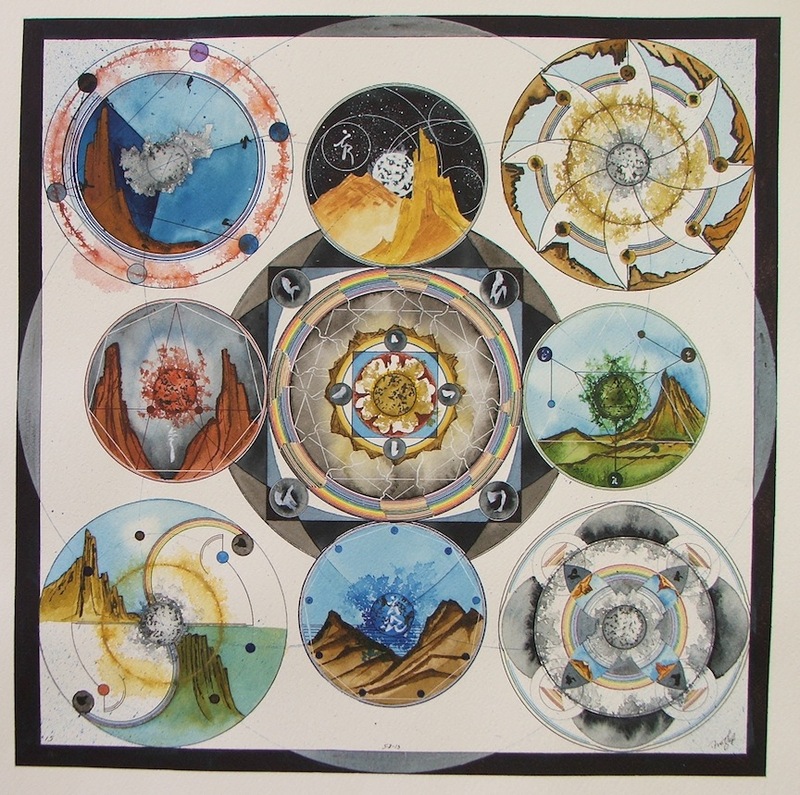 Each mandala of the 9 mandalas drawn are founded on the number series shown here. This why I call the work 15. With a closer look each circle also has characteristics within. The center circle is the earth circle (5). This number is often related to the fibonacci series and the golden ratio phi. Because I also love the relationship of the earth and sun, the center makes reference to the sun. But also because double five, shown as to pentagrams is also 10, the center represents both the beginning and the end of the cycle of nine numbers up to 10. At the top (also east) is the number 1, or spirit. For me spirit is best represented by the stars above a glowing mountain. I also make reference to the moon in this circle whose energy creates life on earth. Without the moon, no pulse, no tides would mean no life. 3 (south), 9 (west), 7 (north) respectively represents the energies of those directions as well. South is passion and growth with greens. West is vision and prayer in blues. North is mystery and elders in reds with another reference to the sun. The five odd numbers are to me feminine thus the center and her directions are female energies which make up the world and her directions. The four corners are masculine even numbers. Each is related to a skill or focal talent. 2 is the will to live and choose. Often choice comes down to opposites represented by the number 2. Two represents a person who is focused on getting things done. 8 is a dreaming. 8 thus spirals and creates worlds or dreams in rapid succession. This energy is both fire and water mixing to set the circle ablaze. 4 holds knowledge and is represented in cool greys of a mental framework. But also this male reflects the directions of the center too. 6 is a number associated with love or intention. The number or structure behind all things. Together the full work is a combination of separate meditations on individual numbers as well as a culminating meditation on creation itself. 15 is the number associated with the light of knowledge, or the building up of light energetic ideas and the breaking down of ideas into their component parts to see things new again. It is thus regenerative.